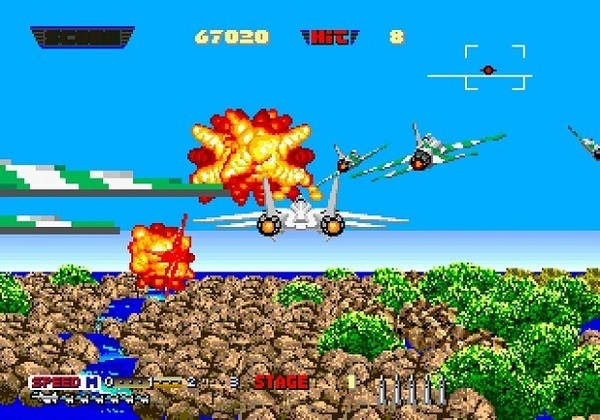 After Burner II was a staple of my arcade diet when I was a kid. Alongside titles such as Outrun, Thunderblade, Hard Driving and Roadblasters. Recent incarnations of the After Burner franchise have been met more than favourably with the recent Xbox Live Arcade port After Burner Climax. 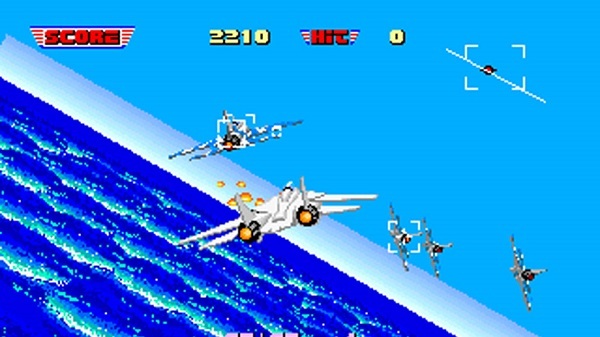 After Burner II on the 3DS brings exactly what you’d hope and expect. The original look and feel of the arcade system with some neat 3D effect to the graphics. OK this doesn’t have the panache and fidelity of a title designed for the modern 3D handheld, but seeing those old flat sprites zip around does add something to the mix. After Burner 2 added very little to the original After Burner arcade experience. In fact the only real notable additions were the addition of a throttle, enemies behind your player F-14 Tomcat, more missiles and adding 3 more stages to the original 18. Added to this on the 3DS remastering are touch controls and a new unlockable “Special” mode. This new mode apes the offering from After Burner Climax. A neat alternative story where stages are mixed slightly and you only get one credit and no continues. As you progress further through this mode you will gain additional lives for greater score. As well as racking up huge scores you will also be filling a burst meter. When this meter fills you can unleash a special mode that will slow down everything on screen for as long as it takes to drain the burst meter. This helps you dodge a few more incoming missiles or maybe dodge a pesky pilot trying to shoot you down from behind. For those unfamiliar with the franchise Afterburner was part shooter and part Outrun. You make your way through multiple short stages trying to take down as many enemy craft as possible. Using the machine guns on your fighter or firing one of your limited supply of missiles you have to dodge incoming craft, missiles, terrain and fire whilst trying to rack up a big score. It’s as simple as that, but takes a fair amount of skill not to just explode every five seconds! 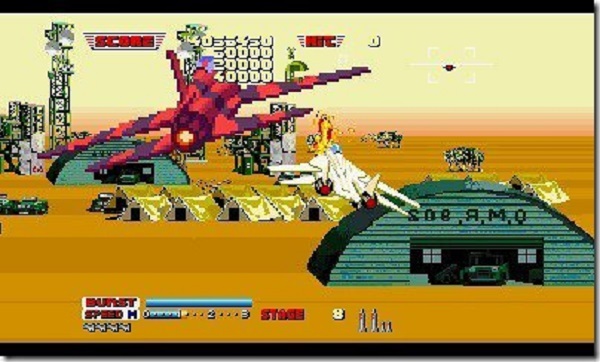 As After Burner II 3DS has roots firmly in that original arcade experience the overall experience with After Burner II can be viewed as shallow. What some see as shallow though others see as a more pure arcade experience. A snippet of pure arcade joy to play whilst commuting to work or school. Maybe taking down a few MiGS whilst waiting at the doctors. Heck you can even just sit back and watch a previously recorded gaming session if you really want to. 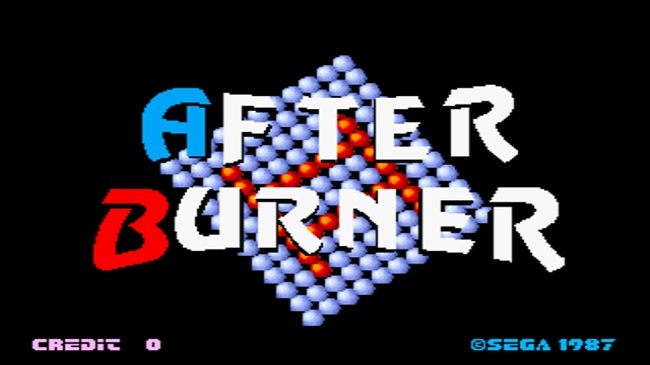 Yes, After Burner II us short, but it’s also incredibly sweet too! Offering a rare arcade purity in the form of the original game mode, coupled with that extended mode and some neat, if not entirely impressive, use of the top screen’s 3D capabilities. 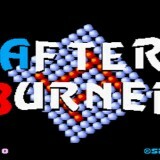 After Burner II is an easy recommendation to those that have played and loved the series in the past. It’s also something worth checking out if you’ve never tried a game in this series (or similar titles like Thunderblade). The experience is short lived, but still great fun. Personally, I was one of those whose playing experience involved exploding every five seconds – I never got the hand of Afterburner. Maybe I never learned its nuances… are there nuances? On the whole, I wish there was more love shown to Thunderblade, which I enjoyed a lot more and has never had the development revisits that Afterburner has. Just so happens that Thunderblade is due soon ! !